The Stock N Lock team have accepted a clothing and textiles bank into their grounds for customers and local residents to donate items. The team co-ordinated with Davina Roberts (Head of Retail) of Daisy Chain Benevolent Fund, with whom Stock N Lock have a longstanding relationship. “Daisy Chain Benevolent Fund is a fantastic charity, offering vital support and assistance to young people. 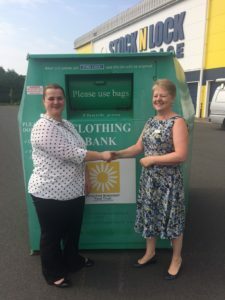 We are delighted to be able to house the clothing bank and welcome local residents to visit us at Venture Business Park, Weir Lane to donate items.